Did you recently open an account with YES Bank? Did you receive the Debit Card? You will get the PIN along with the letter and debit card. What if you reapplied for a new debit card for an existing account? If you lost the PIN, you don't need to worry about it! You can generate Debit Card PIN in YES Bank online without visiting the branch. You need to follow a few steps to generate the PIN. You can generate the PIN from your computer with active internet connection. Step 1: Visit the official website of YES Bank. Click on Explore Products icon to find the products and services offered by YES Bank. Click on 'Online Banking' icon to proceed ahead. The next step is to click on 'Login' button. You need to select ‘Retail’ banking from the drop-down menu. You will get directed to a new page where you need to click on Continue to Net Banking. You will get directed to the 'Login' page. Step 2: Check the page to find 'Generate Debit Card PIN' link and click on it. Step 3: You will get directed to a page where you have to enter the Yes Bank Customer ID and Date of Birth. Click on 'Submit' button. Step 4: The next step is to enter the Transaction Password in the provided space. Click on 'Submit' button after entering the Transaction Password. Step 5: You will get directed to a new page where you need to select the Debit Card. Select the Debit Card Number from the list of debit cards. Enter the new PIN twice without mistake. You have to complete the process within the given time flashing on the screen. Click on 'Submit' button. The screen will display a successful message, and the debit card PIN will generate within a few minutes. You don't need to visit the branch and request to generate a new PIN for the debit card. 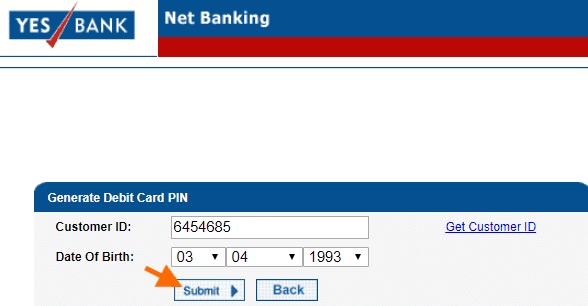 You can generate debit card PIN in YES Bank online within a few minutes following the steps without any error.